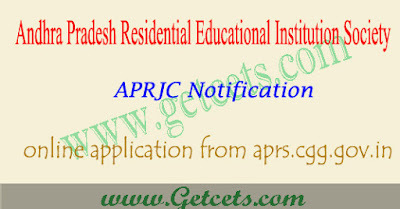 Andhra Pradesh Residential Junior college Common Entrance Test short form as APRJC, which is conducted by APREI Society, they will conduct APRJC CET in every year for admission into 10 APR Colleges, 4 are for Boys, 02 for Girls and 01 for Co-Education, 02 for Minority Boys and 01 for Minority Girl. APRJC application form will commence from 14th March 2020, huge number of students are going to online apply for aprjc 2020 notification. You must send the online application forms through online mode only. Registration will close in the month of April 14, 2020. Download the Notification and check the eligibility criteria before you apply. Check the APRJC official notification shared below to get all the details regarding Eligibility Criteria. Fee details : Interested candidates have to pay Rs.250/- for the Application fee. For candidates belonging to the reserved category, the candidates need to pay as per the official notification. Students who are first attempt in March/April 2020 only eligible to apply for APRJC 2020 Exam. Candidates who have passed in earlier years are not eligible and they need not apply. * GPA of 4 in English for all the candidates. ii. The candidate after satisfying himself/herself about the eligibility criteria for the submission of application through online shall pay a fee of Rs.150.00 through online from 14th March to14th April 2020 for submission of application through Online. viii. On submission of Application ONLINE, the candidate has to take a copy(print) of application form in which a reference number alsobegiven. This Reference number is required to download the Hall Ticket. The copy of online application is to be preserved for further reference. The question papers will be based on 10th class standard in Andhra Pradesh state syllabus for subjects and English will be General English. The test is of objective type with 2½ hrs duration for 150 marks (50 marks for each subject). 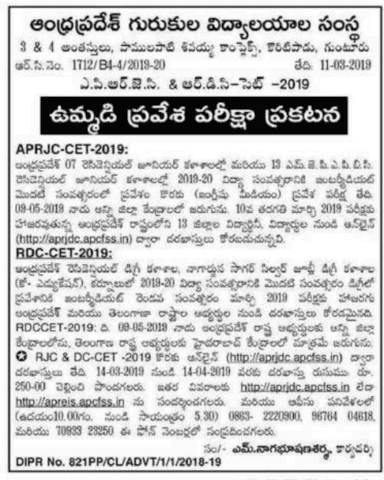 APREIS is going to conduct the APRJC entrance test on 9th May 2020 for aspirants seeking admission in first year Intermediate courses. Candidates can download their Hall Tickets from the website at http://aprjdc.apcfss.in from 01.05.2020 to 08.05.2020 with the reference number allotted to them. TSRJC CET Result 2020 will declare at official portal aprjdc.apcfss.in. APRJC CET Results likely Available in last week of May. Check APRJC CET Rank Card, Counselling Dates & Admission Process, Selection Methods, Reservation form this page. The APRJC CET exam qualified candidates are a call for further counseling. Verify APRJC CET Cutoff & Merit List of entrance test. The APRJC CET Scorecard, Selection List, Result List, Result Date, First Counseling Date and other related details appear on page clearly. Admission will be made through counseling. aprjc first phase counseling for admission will be placed after 01.06.2020. Registration : In this phase, it is mandatory for the selected students to report at their nearest helpline center as per schedule and perform the registration formalities. test among the PHC candidates. Minimum disability is 40%.